After the shouldabeen perfect game, Armando Galarraga and Jim Joyce wrote a book together. Because they've got a business relationship, says MLB, Joyce would not be allowed to work any games involving Galarraga's teams. There's that, and then there's the perception that Joyce owes Galarraga one. Because he does, and it doesn't matter if Joyce is the most equitable man in the world and would never intentionally help out Galarraga: MLB is nipping it in the bud before those kinds of questions even have to be asked. That's being proactive. Meanwhile, the NBA isn't even being reactive. 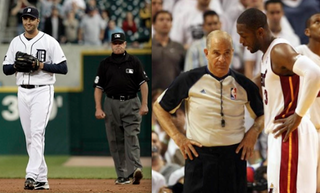 Pretending the chatter about the officiating in the 2006 Finals didn't exist, the league hasn't appeared to respond with its refereeing assignments this year. (Beyond perhaps keeping Danny Crawford away from the Mavs after the first round.) But there's still Joey Crawford, who will be working tonight's game, and who worked game 5 in 2006 as Bennett Salvatore sent Dwyane Wade to the line as many times as all Dallas players combined. Yes, we'll see Salvatore later in this series. Do we really think certain refs are out to get certain players? Not really. But perception matters, and the NBA needs to be more aware of that, when there's one group of people who absolutely care which refs work a game: bettors.